The success here can probably be attributed to the holistic approach of the CEO of the developing company, Propertuity, Jonathan Liebmann, said Kumm. Liebmann has created inviting live, work and play areas within the precinct and has paid great attention to creating a space focussing on the softer elements of inner city living. There is a mix of galleries, artist studios, creative venues, offices, retail spaces and residential units. Maboneng seems to have become a magnet for investment and talent, he said, and has set benchmarks for the social sustainability of a new precinct. The sales numbers speak for themselves, he said. To date there is 100% occupancy at the Main Street Life phase, 100% sold off plan at Revolution House, 100% sold off plan at Fox Street Studios and 40% sold off plan at Artisan Lofts. There is a high owner-occupier ratio (45%) here which, as most property developers and investors realise, bodes well for the long term outlook for the project. REDi, said Kumm, has been mandated to provide the interactive mapping technologies on two projects, The Main Change and Artisan Lofts. This will allow interested parties and stakeholders to understand the Maboneng precinct in terms of location and layout, and to view the available unit types and their relation to the surrounding restaurants, shops, art galleries and features. The Main Change is an office building with spaces to rent or purchase, with units sized from 120m² to 253m². Smaller office space on the third floor is available for start-ups and freelancers. The building features a spa, a meditation zone, an holistic healing centre, health food café, and fashion and furniture stores on the ground floor. The Artisan Lofts phase will offer custom designed living spaces in a three storey building with sizes from 70m² to 200m². The lofts are currently under construction, with a show unit having just been completed and the rest due for completion in 2013. There is a ground floor retail section which includes 25 small shops (15m² in size). The mapping solution for these buildings is supported by the Red-i Sales information Management System (SIMS) which allows the management and sales teams real-time access to information, which means buyers can now sit with a member of the sales team and look at various options online before physically taking a tour. 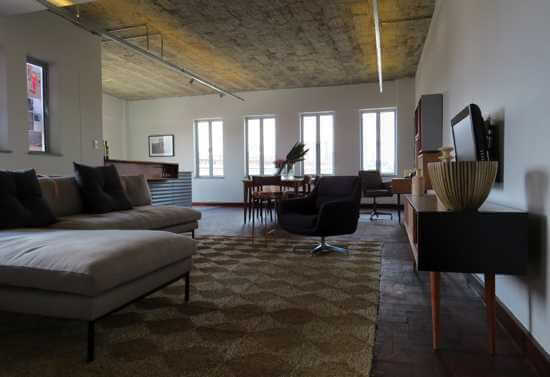 Maboneng has various investment options available, said Kumm, and offers a diverse range of sectional title property. The development currently comprises seven buildings which are being developed and a further ten planned over the next two years. “If one considers the value for money here and the prospect of respectable rental yields, combined with Urban Development Zone tax incentives, this an ideal place to build an investment portfolio,” he said. For further information on what REDi has to offer contact Andrew Kumm on 082 870 4346 or email andrew@red-i.co.za.